The authorities continue their mission of removing church crosses by whatever means possible. In Mainland China, a campaign of forced demolitions or removals of church crosses has been underway since the past four years. As of July 2015, over 1700 crosses had been removed in Zhejiang province alone. Because the authorities often meet protests by members, they have resorted to carrying out their mission by using trickery and deceit as well. 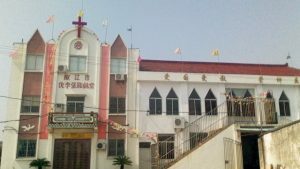 In August 2016, the authorities targeted the Three-Self Fengqiao Church in Zhejiang’s Haining city. The church was located in the Sanlian village and a state-sanctioned one. The officials from United Front Work Department convened a meeting of its Christian Council and the Three-Self Patriotic Movement to discuss the matter. Following this, a notice was issued to Wang Xinyue (pseudonym), the church head, that the authorities would remove the cross in the next few days. However, Ms. Wang fiercely resisted the order. She even locked up the gates of the church to prevent authorities from entering. Soon, the officials arrived with the cranes and a lifting frame on August 23. Seeing the protestors, Mr. Li, the head of the United Front Work Department pretended to want to sort out the matter amicably. He took Ms. Wang inside the church to talk but unbeknownst to him, also gave the orders for the cross to be removed at the same time. Ms. Wang was outraged when he came out and figured out all that had transpired. However, he was again intimidated and threatened by Mr. Li, who said, “If anyone dares to speak out about this cross being removed or takes a video and leaks it out, there will be consequences.” Her salary was then cut off by the Christian Council and Three-Self Patriotic Movement. A year later, Ms. Wang, suffered a sudden cerebral infarction and fell to ground. She has since recovered but continues to live in a state of mental anguish due to pressure from authorities over her faith.